The Median language (also Medean or Medic) was the language of the Medes. It is an Old Iranian language and classified as belonging to the Northwestern Iranian subfamily, which includes many other languages such as Azari, Gilaki, Mazandarani, Kurdish (Zazaki, Gorani, Sorani, Kurmanji), and Baluchi. Some modern research suggests that the so-called Linear Elamite, which still has not been deciphered, may have been written in the language of Medes, by assuming Kutik-Inshushinak was the original Iranian name of Cyaxares the Great and not a much earlier Elamite king. A number of modern Iranian languages spoken today have had medieval stages with evidences found from citations in Classical and Early Modern Persian sources. G. Windfuhr believes, "The modern [Iranian] languages of Azarbaijan and Central Iran, located in ancient Media Atropatene and Media proper, are 'Median' dialects" and those languages "continue lost local and regional language" of Old Median, which is mainly known as "Medisms in Old Persian." 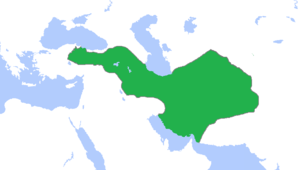 The term comes from the regional name Pahlav/Fahlav (see fahlaviyat) in traditional medieval Persian sources and is used to call "dialect poetry and other samples of locales in western Iran reflects the Parthian period" of those regions and their languages "being survivals of the Median dialects have certain linguistic affinities with Parthian". ↑ "Ancient Iran::Language". Encyclopædia Britannica Online. 2007. Retrieved 2007-03-09. ↑ Schmitt, Rüdiger (1989). Compendium Linguarum Iranicarum. Wiesbaden: Reichert. 1 2 3 Skjærvø, Prods Oktor (2005). An Introduction to Old Persian (PDF) (2nd ed.). Cambridge: Harvard. ↑ Dandamayev, Muhammad & I. Medvedskaya (2006). "Media". Encyclopaedia Iranica (OT 10 ed.). Costa Mesa: Mazda. ↑ "Ancient Iran::The coming of the Iranians". Encyclopædia Britannica Online. 2007. Retrieved 2007-02-28. ↑ Kent, Roland G. (1953). Old Persian. Grammar, Texts, Lexicon (2nd ed.). New Haven: American Oriental Society. pp. 8-9. ↑ Diakonoff, Igor M. (1985). "Media". In Ilya Gershevitch. Cambridge History of Iran, Vol 2. London: Cambridge UP. pp. 36–148. ↑ Tafazzoli, Ahmad (1999). "Fahlavīyāt". Encyclopaedia Iranica. 9.2. New York: iranicaonline.org.